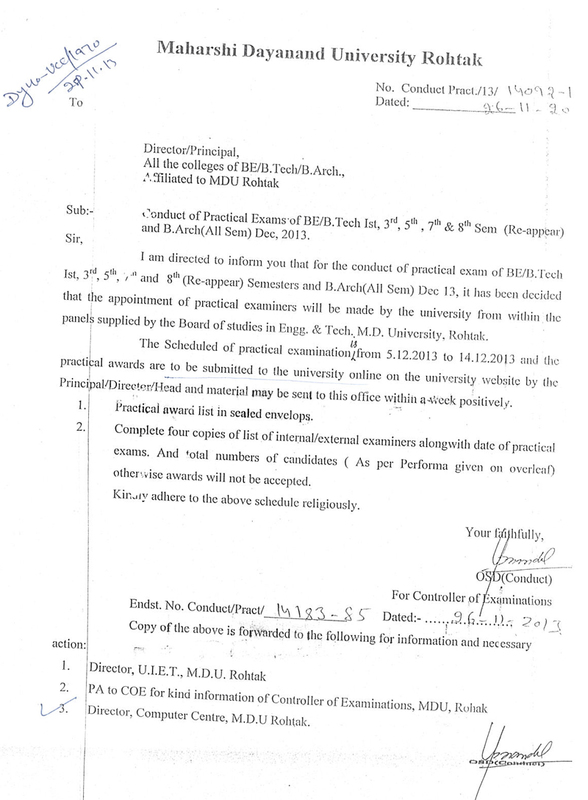 I am directed to inform you that for the conduct of practical exam of BE/B.Tech Ist, 3rd, 5th, 7th and 8th (Re-appear) Semesters and B.Arch(All Sem) Dec 13, it has been decided that the appointment of practical examiners will be made by the university from within the panels supplied by the Board of studies in Engg. & Tech. M.D. University, Rohtak. The Scheduled of practical examination from 5.12.2013 to 14.12.2013 and the practical awards are to be submitted to the university online on the university website by the Principal/Director/Head and material may be sent to this office within a week positively. 1. Practical award list in sealed envelops. 2. Complete four copies of list of internal/external examiners alongwith date of practical exams. And total numbers of candidates ( As per Performa given on overleaf) otherwise awards will not be accepted. Kindly adhere to the above schedule religiously.